A Real Adventure Time Card Game. And A Digital One. All The Card Games. Remember that one episode of Adventure Time where Finn and Jake played "Card Wars" against each other? Soon you'll be able to do that to. Play "Card Wars", not remember the episode. Not that you won't remember. Ahem. Card games, and digital card games are coming, yo. 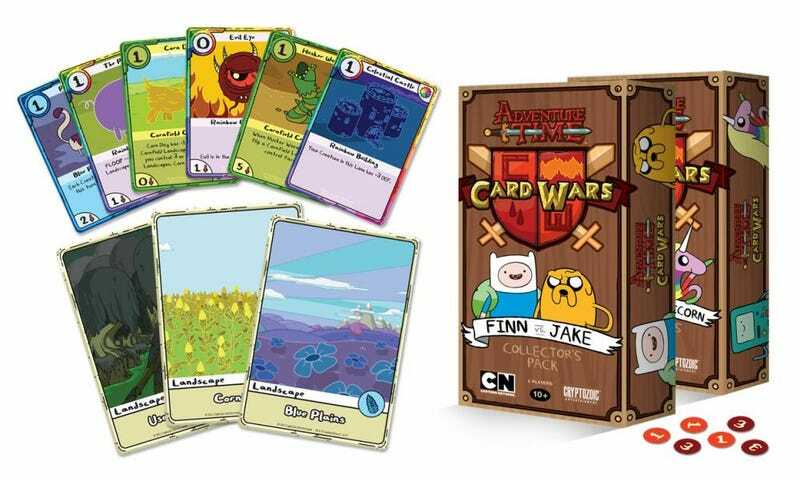 Coming on Wednesday, February 19 to a specialty card retailer or that one Walmart aisle near you, Cryptozoic's Adventure Time: Card Wars is a customizable card game in which players use decks of cards to battle each other, just like they did in that thing. There'll be two boxes at $20 per, one with Jake's Corn Deck vs. Finn's Blue Plains Deck, one with BMO's Useless Swamp Deck Vs. Lady Rainicorn's Sandy Lands Deck. It's like magic! Actually it sounds a lot like Magic. Each turn, players can spend Action Points on Creatures, Spells and Locations. Some creatures have special FLOOP abilities that activate their special ability. Other creatures have combat abilities that will aid greatly in players' efforts to reduce their opponent's Hit Points to zero. The player who successfully does that first is declared the Cool Guy, and wins the game. Meanwhile, in mobile gaming world, D3Publisher will be releasing Adventure Time: Card Wars: The Mobile Game. Developed by King Fu Factory, the game features 20 playable characters, craftable cards, tons of creatures, spells and abilities, tournament battles, and a holographic game board that sounds like the bee's knees. That'll be $3.99 with in-app purchases. Sounds like the better deal. Oh wait, the physical card game will contain download codes for the mobile one. Going to have to buy them both. Sorry.